The Rock N Roll inflatable interactive game turns amateur jousters into rock stars! Players enter the six-sided arena and climb onto the raised center pedestal for a jousting match. There is just enough room on top the pedestal so that players will have to both rock and roll to maintain their balance. A contestant wins when he or she has defeated the opponent and claims the pedestal. The Rock N Roll interactive inflatable game has a bright and beckoning exterior, and a dizzying red- and blue-striped interior floor perfect for celebratory jumping, giving it the draw power for hours of traffic. 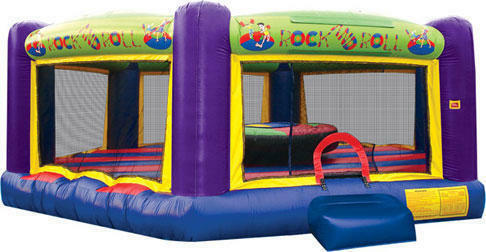 The Rock N Roll inflatable jousting game is a great way to promote exercise and healthy competition and sportsmanship. 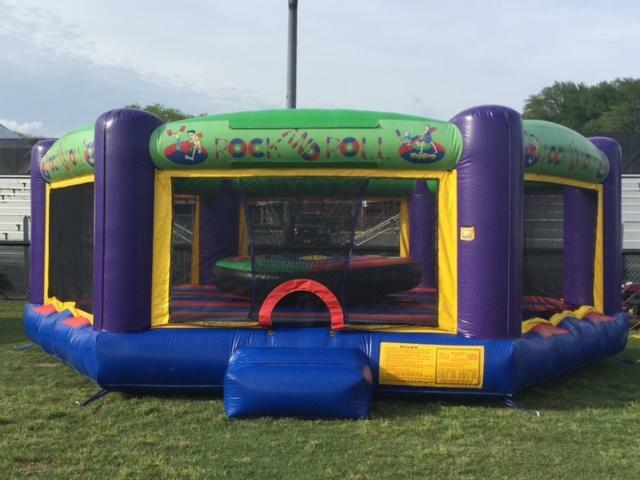 This inflatable jousting game is a great addition to any Party Rental or outdoor event! Our exclusive line of games are made safe and secure with lite n strong™, fire-resistant vinyl making it safer, portable and more durable.